Manchester by the Sea is a movie wherein the more you discuss the great aspects of the film, the more it sounds like your worst nightmare. And by discussing the film, I do mean with someone that has seen it, as significant parts of the film should be left to unfold on their own. This genuine drama just may be the most realistic portrayal of full-blown paralyzing guilt to hit the big screen. Both Casey Affleck and Michelle Williams give stellar performances as they fight their personal battles with grief. Yep, sounds like a downer, doesn’t it? Well, I’m not going to candy-coat this; it is. However, here’s the great news—Manchester by the Sea is one of the best films of 2016. Writer-director Kenneth Lonergan (You Can Count on Me, 2000) and (Margaret 2011) is no stranger to crafting stories that are chock full of everyday dialog that succeeds in magnifying human nature while finding humor in the smallest of nuances. Those in the film business know that Margaret was held up for five years in court costs and lawyers fees due to differences between the studio and Lonergan’s final cut length. 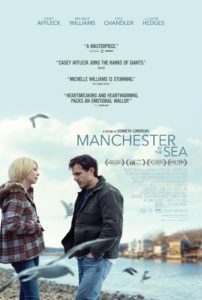 He was in serious financial debt when John Krasinski and Matt Damon, producer of the film, went to him with the original idea for Manchester by the Sea, and asked him to write the screenplay. 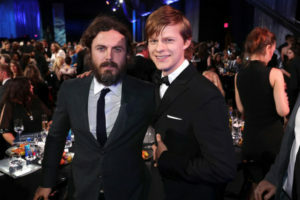 The film has received eight nominations for our Critics Choice Awards, and Casey Affleck won Best Actor in a Film, Kenneth Lonergan won Best Screenplay, and Best Young Performer, Lucas Hedges. 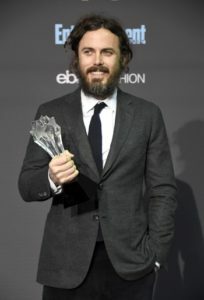 It received five nominations from the Golden Globes, and Casey Affleck won Best Actor in a Drama Motion Picture. 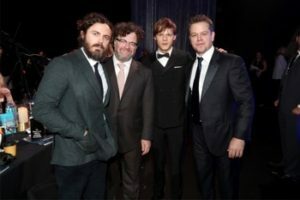 The main premise of the film focuses on Lee Chandler (Casey Affleck), a loner apartment handyman in Boston who has violent outbursts that lead to fistfights. When we first meet Lee, we know something isn’t quite right with him, as he appears to have a chip on his shoulder, although we aren’t sure if that’s even the problem. In contrast, during a flashback, we also see Lee on a fishing boat with his nephew Patrick, enjoying an afternoon on the sea with his family. Onstage during The 22nd Annual Critics’ Choice Awards at Barker Hangar on December 11, 2016 in Santa Monica, California. Very shortly, we discover that his older brother Joe (Kyle Chandler), has passed away and Lee is shocked to learn that Joe has made him sole guardian of his nephew Patrick (Lucas Hedges). Lee grudgingly returns to his boyhood hometown of Manchester-by-the-Sea to care for Patrick, a strong-willed 16-year-old, and is forced to deal with his past that separated him from his wife Randi, (Michelle Williams, My Week with Marilyn, 2011). Lee is obliged to step up to the plate and become somewhat of a father figure to his grieving nephew, Patrick. Neither is prepared for this awkward situation in which Patrick wants to continue his life as normally as possible. Lee, on the other hand, wants to move to Boston to resume his life away from Manchester where he’s still haunted by his personal tragic family memories. One does wonder why Lee would want to leave Manchester, a picturesque quaint New England town, as its beautifully shot land and seascapes by cinematographer Jody Lee Lipes (Trainwreck, 2015) give the impression of paradise. Soon, by flashbacks, we find out the reason Lee wants nothing to do with the town, nor its people and is it ever a whopper. Be forewarned; you may find yourself tearing up. The natural comedy that’s scattered throughout the running narrative between Lee and Patrick does bring us welcome relief from this heavy drama. Yes, this drama is watchable; it’s everyday life with unexpected bad circumstances. Lucas Hedges is perfect as teen Patrick; he’s very convincing in the role and you’ll find yourself looking forward to what he’s going to say or do next. He’s constantly pushing the boundaries. My favorite conversation in the film is when Patrick is trying to persuade Lee into not moving to Boston. Patrick: Anyway, what’s in Boston? You’re a janitor. Patrick: You could do that anywhere. There are plenty of toilets and clogged up drains all over town. Lee Chandler: I don’t want to talk about it. Patrick: All my friends are here. I’m on the hockey team, I’m on the basketball team. I got to maintain a boat now. I work on George’s boat two days a week, I got two girlfriends, and I’m in a band. You’re a janitor in Queensie. What the hell do you care where you live? The great part about the film is that we do meet both of Patrick’s girlfriends and see his motley crew of a teen rock band practice, along with his hockey playing. We do get to know Patrick’s friends and see his teenage life. In terms of relating to the grief in the film; one can relate to the film as a family member—as how would you act or behave given the circumstances? Yes, these characters are in tough situations and simply navigating through life, but it’s the attention to the details of this finely tuned script that deserves our attention. The dialogue in Margaret is similar in complexity and self-interest. The drama is so real that at times it feels like we are eavesdropping on a friend’s private family home movies. Williams and Affleck do share a scene that is only about 15 minutes of screen time. It’s so notable in the film that I don’t have to set it up; you’ll know which one it is. Williams’s narrative is that of an apology of sorts, during which, again, you may find yourself tearing up. Williams is excellent in this scene, just as Affleck’s bland behavior is true to his character. The scene is raw and uncomfortable, but again, most likely true to life. Be prepared for numerous “f-bombs” that are dropped in the film along with other swear words. It’s a given and never lets up. Mainly, parents beware. The Bottom-Line? : Despite the misery involved in this highly emotional film, the finely tuned script along with outstanding performances is reason enough to see this film.